Welcome to Reveal Day 3 for our January Release! Today we have a fun new Love/Valentine themed set featuring owls called Love Owl-ways! We also have a giveaway today so make sure you read all the way to the bottom of this post to see how to win! Our Design Team had a Hoot creating projects using these cute owls! 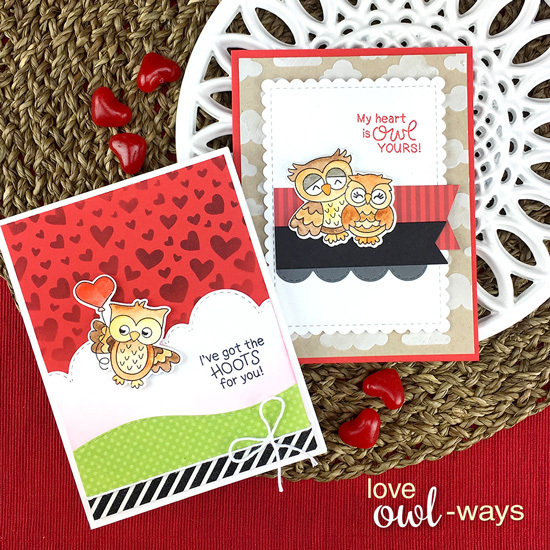 For her adorable Valentine, Andrea used two of the owls from the new Love Owl-ways Stamp Set. Isn't it cute how the one is flying in with a love note to give the other? She also added in a branch and leaves using our What a Hoot Stamp Set. This card by Larissa is so soft and pretty! She featured the owl carrying a love note from the new Love Owl-ways Stamp Set. Then she created that lovely sky using hearts from our Tumbling Hearts Stencil along with clouds cut out using our Sky Borders Die Set. She also added a scalloped panel to frame the whole scene using our Frames & Flags Die Set. 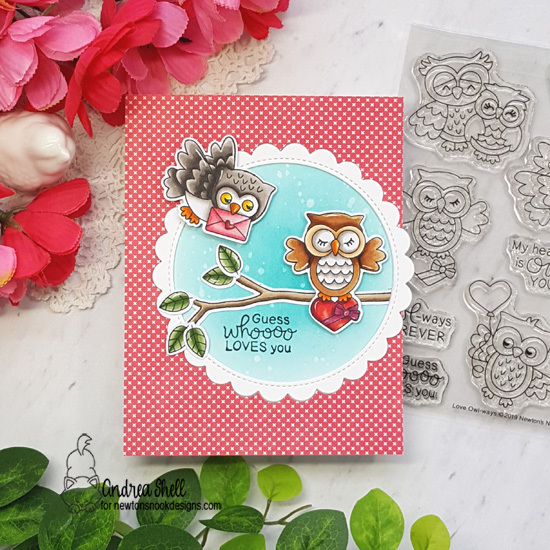 Zsofia featured three of the owls from our new Love Owl-ways Stamp Set on her card today. It's so cute how she created three stripes of pink and added one owl to each strip along with a sentiment from the set! What a fun way to showcase all three images when you can't decide which one to use! 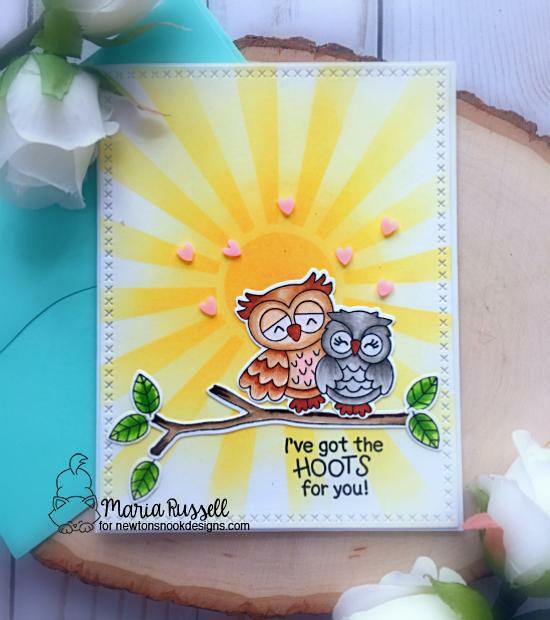 Maria created this cheerful owl card using the new Love Owl-ways Stamp Set. She featured the image of the owl couple from the new set sitting on a branch from our What a Hoot Stamp Set. The sunny background behind them was added using our Sunscape Stencil and it gives the card such a warm and cozy feeling! This cute owl is bringing mail to Newton! How fun is that? 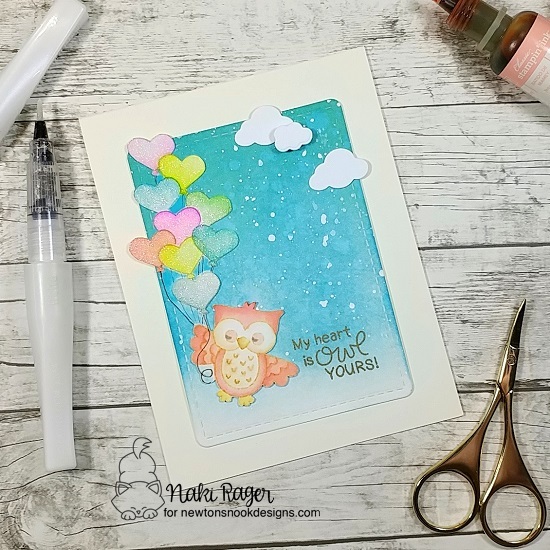 Amanda created this fun scene using the owl carrying a love note from our new Love Owl-ways Stamp Set combined with Newton in the mailbox from our Newton's Happy Mail Stamp Set. She also used our Frames & Flags Die Set for the banner that holds the sentiment and for the Scallop edged border. 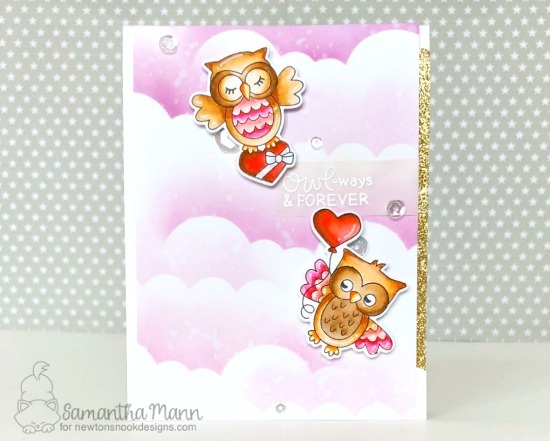 The owls are so cute floating in the purple sky on this card by Samantha! She used the two owls from the new Love Owl-ways Stamp Set and colored them with adorable pink accents on their wings and bellies! Then she created a lovely sky full of fluffy purple clouds, using a cut out of our Sky Borders Die Set as a mask for the ink. She added the sentiment, embossed on a stripe of vellum to finish the dreamy scene. The owl on this card by Naki has SO MANY balloons! She created this delightful scene using the owl from the new Love Owl-ways Stamp Set. She stamped a bunch of extra heart balloons using the same image and some creative masking! Plus, don't you love the sparkle on the balloons? She also used the stitched rectangle from our Frames & Flags Die Set for the background panel and added in two little clouds from the Newton Scoots By Die Set. Holly created an adorable cloudy sky scene using two of the owls from our new Love Owl-ways Stamp Set. She colored the owls with copics and added fun white gel pen details. For her sky, she used our Cloudy Sky Stencil with white embossing paste and added some blue ink to the center. So cute! This charming owl card by Tatiana is perfect for sending a love and happy mail! 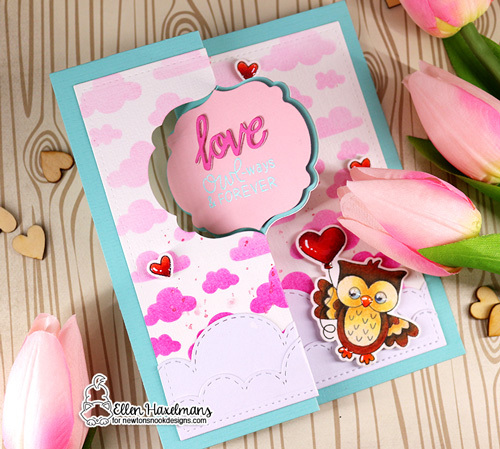 She used the owl holding a love letter from our new Love Owl-ways Stamp Set. Then she added in a whole bunch more letters using the Sending Hugs Stamp Set. So adorable! Ellen created a playful interactive Valentine that is so fun to open! 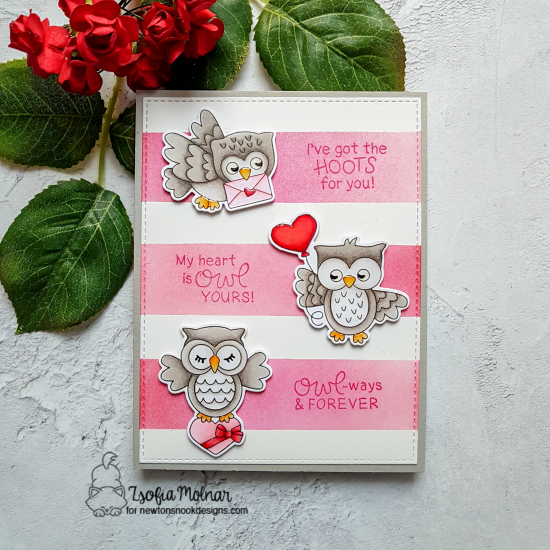 She featured one of the owls from our new Love Owl-ways Stamp Set on the front and then when you pull the card open, it flips to reveal one inside! Make sure you pop over to her blog today to see more photos. She also added in little pink clouds using our Cloud Sky Stencil and a layer of clouds across the bottom using our Sky Borders Die Set. She added in the word "love" from our Darling Hearts Die Set. What a sweet and darling set! Perfect for love themed card! Love to see how everyone came out with different ideas, designs and colors! Great reveal!!! what fun stamps! LOVE all the cards! These are all adorable! I love the owls!!!! Great hop... DTs killing it as usual! I love owls! Look at those cuties! Adorable cards by everyone! card & heart balloon. Love!!! You've illustrated such CUTE owls Jen! I love the one flying with the letter in his beak! Such a sweet, fun OWL filled hop! I love it! Such a fantastic 2019 design team! yay! This owl set is so sweet...great variety of images. Darling stamp set and wonderful inspiration from the design team. Adorable cards with these cute owls! Great designs! Love these sets! I've always loved owls and these are super cute! I'd love to win this stamp set. It's so cute. A standing owl-vation for these darling owls!! so very cute stamp set! Sweet cards and I love the owl stamps! Glad you showed some cute owl cards today because I love owls!! “I’ve got the hoots for you” 🤣, that’s hilariously awesome! My owl obsessed daughter would fight me for this set! Very cute stamp and die set, I love owls! Very cute set, I love the one delivering the letter. Simply darling! Love the inspiration! Whoooo wants this adorable stamp set? I do! So cute! Oh my! These owls are adorable! Would love to share with my best friend who also loves owls! OMG Owl always love this set!! So much inspiration....Thank you!! I've got the hoots for this set. This owls are super sweet and adorable....I'm in loooove with them! I love owls, so when I saw the peek on FB, I knew I had to check this post out. So cute!! So stinking cute...what a hoot! Whooo doesn't love an owl? These stamps are just adorable. Everyone's cards are super adorable! Love them all! The owl stamp set is super cute! All these cards are adorable, Thanks for the chance to win.